Here is Vela's standard non-disclosure agreement. Please download the .pdf document and return the completed and signed agreement to Vela at contracts@tradevela.com. WHEREAS, each Party is willing to provide confidential information to the other Party with the understanding that such information will remain confidential in accordance with the terms of this Agreement. Confidential Information. As used in this Agreement, “Confidential Information” means any information, data, documents, agreements, files and other materials of a Party or its affiliates (a “Disclosing Party”) which is furnished by or on behalf of Disclosing Party to the other Party (a “Receiving Party”), whether disclosed orally or disclosed or stored in written, electronic or other form or media. Confidential Information also includes all analyses, compilations, reports, forecasts, studies, samples and other documents prepared by or for Receiving Party which contain or otherwise reflect or are generated from any Confidential Information. Notwithstanding the foregoing, Confidential Information shall not include information which: (i) is or becomes generally available to the public other than as a result of a wrongful disclosure by Receiving Party, (ii) is already within Receiving Party’s possession, provided that the source of such information is not bound by a contractual, legal or fiduciary obligation of confidentiality to Disclosing Party or any other party with respect to such information, (iii) becomes available to Receiving Party on a non-confidential basis from a source other than Disclosing Party, provided that such source is not bound by a contractual, legal or fiduciary obligation of confidentiality to Disclosing Party or any other party with respect to such information, or (iv) was developed by Receiving Party without reference to or the benefit of the Confidential Information of Disclosing Party. Restrictions. Receiving Party shall keep the Confidential Information strictly confidential and shall not use the Confidential Information for any purpose other than to evaluate, negotiate and consummate the Proposed Transaction. Receiving Party shall not disclose or permit its affiliates or their respective directors, officers, employees, stockholders, members, managers, partners, agents or consultants (including attorneys or accountants) (collectively, “Representatives”) to disclose any Confidential Information except: (a) if required by law, regulation or legal or regulatory process, but only in accordance with Section 3, or (b) to its Representatives, to the extent necessary to permit such Representatives to assist Receiving Party in evaluating, negotiating and consummating the Proposed Transaction; provided, that Receiving Party require each such Representative to be bound by the terms of this Agreement to the same extent as if they were parties hereto and Receiving Party shall be responsible for any breach of this Agreement by any of its Representatives. Except for such disclosure as is necessary not to be in violation of any applicable law, regulation, order or other similar requirement of any governmental, regulatory or supervisory authority, Receiving Party shall not, and shall not permit any of its Representatives to, without the prior written consent of Disclosing Party, disclose to any person: (a) the fact that the Confidential Information has been made available to it or that it has received or inspected any portion of the Confidential Information, (b) the existence or contents of this Agreement, (c) the fact that investigations, discussions or negotiations are taking or have taken place concerning the Proposed Transaction, including the status thereof, or (d) any terms, conditions or other matters relating to the Proposed Transaction. Notwithstanding the foregoing, Company acknowledges that Vela is a reseller of certain software products and a redistributor of certain market data products. 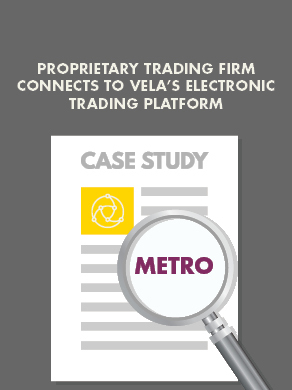 In the instance where Vela is acting as a reseller or redistributor of such products or services which relate to the Proposed Transaction, Company acknowledges Vela may disclose appropriate information to the originating firms whose products Vela is reselling, including without limitation any market exchanges or product providers. Required Disclosure. If Receiving Party or any of its Representatives is required, upon the advice of Receiving Party’s counsel, to disclose any Confidential Information, by law, regulation or legal or regulatory process, Receiving Party shall (a) take all reasonable steps to preserve the privileged nature and confidentiality of the Confidential Information, including requesting that the Confidential Information not be disclosed to non-parties or the public; (b) give Disclosing Party prompt prior written notice of such request or requirement so that Disclosing Party may seek an appropriate protective order or other remedy; and (c) cooperate with Disclosing Party to obtain such protective order. In the event that such protective order or other remedy is not obtained, Receiving Party (or such other persons to whom such request is directed) will furnish only that portion of the Confidential Information which, on the advice of Receiving Party’s counsel, is legally required to be disclosed and, upon Disclosing Party’s request, use its best efforts to obtain assurances that confidential treatment will be accorded to such information. Acknowledgments. Receiving Party understands and agrees that neither Disclosing Party nor any of its Representatives: (a) have made or make any representation or warranty hereunder, expressed or implied, as to the accuracy or completeness of its Confidential Information or (b) shall have any liability hereunder to Receiving Party or its Representatives relating to or resulting from the use of its Confidential Information or any errors therein or omissions therefrom. The Parties agree that unless and until a definitive agreement between the Parties has been executed and delivered with respect to the Proposed Transaction, neither the Parties nor their respective affiliates will be under any legal obligation of any kind whatsoever with respect to the Proposed Transaction (other than the obligations expressly set forth in this Agreement regarding Confidential Information), including any obligation to (i) consummate the Proposed Transaction, (ii) conduct or continue discussions or negotiations regarding the Proposed Transaction or (iii) enter into or negotiate a definitive agreement regarding the Proposed Transaction. Disclosing Party reserves the right, in its sole discretion, to reject any and all proposals made by Receiving Party with regard to the Proposed Transaction, to terminate discussions and negotiations with Receiving Party at any time and to enter into any agreement with any other person or entity without notice to Receiving Party or any of its Representatives, at any time and for any reason or no reason. Rights and Remedies. Receiving Party agrees that monetary damages would not be a sufficient remedy for any breach of this Agreement by Receiving Party or its Representatives, and that, in addition to and without limitation of any other rights and remedies it may be entitled to, Disclosing Party shall be entitled to seek specific performance and injunctive or other equitable relief as a remedy for any such breach, without the necessity of posting a bond or the necessity of proving actual damage or the likelihood of irreparable harm, and Receiving Party, on behalf of itself and its affiliates and Representatives, hereby waives any defense that Disclosing Party would have an adequate remedy at law. Return of Materials. Receiving Party shall return or destroy all Confidential Information furnished by Disclosing Party (including all copies, extracts or other reproductions thereof and whether stored in written, electronic or other form or media) to Disclosing Party, and provide written confirmation to Disclosing Party of its compliance with such obligation, within ten (10) days of receipt of written notification from Disclosing Party. Notwithstanding the foregoing, Receiving Party will continue to be bound by its confidentiality and other obligations under this Agreement regarding all Confidential Information. Property. All Confidential Information is and shall remain the property of Disclosing Party. Except for purposes of its internal evaluation of the Confidential Information as set forth herein, Disclosing Party does not grant Receiving Party any license, by implication or otherwise, to use any Confidential Information or any license rights in any patent, copyright or other intellectual property or proprietary rights. Non-Solicitation of Employees. Except with the express permission of Disclosing Party or as expressly contemplated pursuant to the terms of a definitive agreement executed and delivered by the Parties with respect to the Proposed Transaction, Receiving Party agrees that, for a period of two years from the date of this Agreement, neither Receiving Party nor its Representatives will directly or indirectly solicit or hire any employee of Disclosing Party or any of its affiliates, except pursuant to a general solicitation which is not directed specifically to any such employees. Duration. This Agreement will terminate two (2) years from the date hereof. Upon the termination of this Agreement, the parties’ obligations of nondisclosure and nonuse of the Confidential Information shall survive and continue for a period of three (3) years from the termination date. Notwithstanding the foregoing, Receiving Party acknowledges and agrees that throughout the period of time during which any Confidential Information remains a trade secret under applicable law, Receiving Party shall not, directly or indirectly, divulge or make use of any trade secret without the prior written consent of Disclosing Party. Preservation of Attorney-Client Privilege. To the extent that any Confidential Information includes materials subject to attorney work-product protections, attorney-client privileges or similar protections and privileges, Disclosing Party is not waiving, and shall not be deemed to have waived or diminished, any such protections or privileges as a result of disclosing any Confidential Information to Receiving Party or any of its Representatives. Miscellaneous. This Agreement sets forth the entire agreement regarding the Confidential Information, and supersedes all prior negotiations, understandings and agreements. No provision of this Agreement may be modified, waived or changed except by a writing signed by the Parties. If any provision of this Agreement shall be held by a court of competent jurisdiction to be illegal, invalid, or unenforceable, the remaining provisions shall remain in full force and effect. Neither this Agreement nor any of the rights or obligations hereunder may be assigned by any Party without the prior written consent of the other Party, and any purported assignment without such consent shall be void and unenforceable. This Agreement shall inure to the benefit of, and be binding upon, the parties hereto and their respective permitted successors and assigns. This Agreement shall be construed and interpreted in accordance with, and governed by, the laws of the State of New York without regard to conflicts-of-law principles that would apply the law of any other jurisdiction. This Agreement may be executed in any number of counterparts, each of which when so executed and delivered shall be an original (including any facsimile or other electronic transmission thereof), and such counterparts shall constitute one and the same instrument.